Waiting on Wednesday #8 - Next Page Please! A surprising, utterly romantic companion to My Life Next Door—great for fans of Sarah Dessen and Jenny Han. 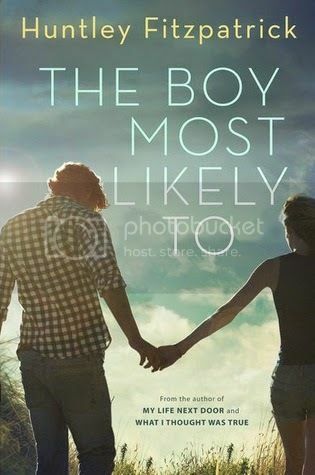 Tim Mason was The Boy Most Likely To find the liquor cabinet blindfolded, need a liver transplant, and drive his car into a house Alice Garrett was The Girl Most Likely To . . . well, not date her little brother’s baggage-burdened best friend, for starters. For Tim, it wouldn’t be smart to fall for Alice. For Alice, nothing could be scarier than falling for Tim. But Tim has never been known for making the smart choice, and Alice is starting to wonder if the “smart” choice is always the right one. When these two crash into each other, they crash hard. Then the unexpected consequences of Tim’s wild days come back to shock him. He finds himself in a situation that isn’t all it appears to be, that he never could have predicted . . . but maybe should have. And Alice is caught in the middle. Told in Tim’s and Alice’s distinctive, disarming, entirely compelling voices, this novel is for readers of The Spectacular Now, Nick and Norah’s Infinite Playlist, and Paper Towns. C'mon, it's a spin-off of My Life Next Door. Okay, okay, so you may be thinking,"What is so good with My Life Next Door." You have to read it to understand. I am urging to read My Life Next Door so you can read this book. So tell me: What are you Waiting for this Wednesday?